Today I am looking at the topic of prayer. I’m starting in Matthew Chapter 6, where Jesus is teaching his disciples about seeking God’s approval, and how to pray. My good works should be done to glorify God, not myself. My prayers should be from me to God, in private. I don’t need to be eloquent or educated or long-winded. I just need to turn to Him in prayer. He already knows what I need. This prayer is an acknowledgement of, and pledge of allegiance to God’s plan. It is an expression of trust that He is the one in control over everything! In this prayer we admit that we sin and need forgiveness. It is also an affirmation that Satin is real and that we need God’s protection from him. God’s forgiveness of my sins depends on my willingness to forgive those who have done wrong to me. Why would I let my own un-forgiveness separate me from God? I leave my study today humbled and thankful for His guidance and control over all. 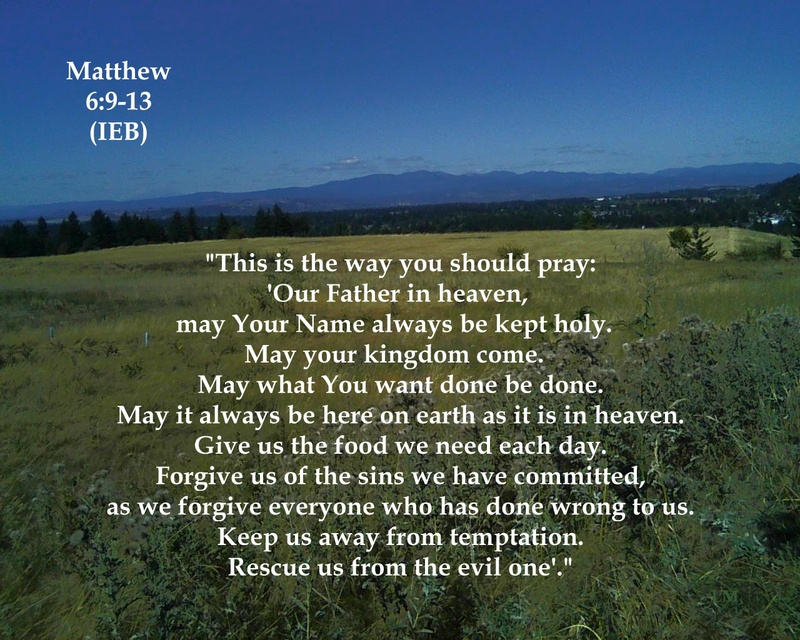 Yesterday’s Bible study covered what Jesus said to his disciples about praying to God. Today I am looking at other scriptures that address prayer. Throughout the New Testament the writers say: “I always thank my God as I remember you in my prayers”. So clearly I am to come to God with a thankful heart. I should be thanking God for taking care of my needs, and have confidence that He has. I may not have control over some things, but I do have control over my own willingness to forgive. My forgiveness may or may not matter to the person I am forgiving, but it matters a great deal to me if I want God to forgive me and hear my prayers. Christ came to give us hope! If I have accepted Christ as my savior and choose to be anything but hopeful, it’s the same as rejecting Him. Troubles come to everyone, but they don’t need to be the end of the world if I have faith that the Lord will see me through. Pray constantly. That appears to be a big order! But if I turn to the Lord when I’m happy and when I am troubled – that pretty much covers my day! But the scriptures above clearly tell me my prayers should ask God for what I need, or let God know what I am asking. Clearly my prayer is not for His enlightenment, but for mine. My going to God in prayer says; I can’t do this on my own; He is the one in control. What is under my control is my attitude. If I want my prayers to be heard I must first forgive the wrongs that others have done to me. I need to go to the Lord with a thankful heart, with faith that He has provide all that I need. Sometimes that is simply the patience to endure. Zechariah and Elizabeth were old, and had no children. I am sure they had both been praying for a child for decades! God could have answered their pray at any time, but their son John (the Baptist) was part of God’s plan for our salvation. He answered their prayer at the appropriate time. I am reminded that Zachariah and Elizabeth remained faithful and continued to do His will while they waited for their prayer to be answered. The people had been praying for them, “something” happened to cause them to put their hope upon God and not themselves, and God rescued them. This is an answer to prayer. I am assured here that my prayers for others are heard and do make a difference. I leave my study today reminded that there is power in prayer. If I am in trouble I need to pray, and ask others to pray for me too. While I am praying, I need to have faith and continue to be obedient, even if it seems as if my prayer is not being answered. And finally, there is power in praying for each other. A friend of mine posted an article on Facebook (April 20, 2015) taken from the breakingchristiannews.com web site. The article was titled “Australia Calls World to Pray and Fast for 7 days for USA. “(Australia) – The team behind Australia’s National Day of Prayer and Fasting, along with other prayer leaders are calling the nations of the world to prayer and fasting for seven days for USA. This period of prayer took place from April 30 – May 6, 2015. April 30 is America’s National Day of Repentance, and May 7 is the United States 64th Annual National Day of Prayer. I found myself humbled to realize people in other nations were planning to fast and pray for MY country. To be truthful, I also felt more than a little embarrassed that we are in such obvious need of those prayers. I am ashamed that I have not made fasting and praying for my country a priority. That changes today! Paul is talking to Christ’s church here, the people who have obeyed the Gospel and are baptized believers. They are already saved by grace and faith, but he is praying that they realize what they have been given through Christ. That they will grow in their faith! To do everything to please the Lord so they can fully experience the gift of freedom in Christ. Sometimes I feel so overwhelmed by the world that I don’t know what to pray. I am bookmarking this passage from Colossians 1: 9-14, for my prayers for God’s people as well as myself. The Father has given us the most glorious gift! He has entitled us to have a part of what the holy people will receive. We have been rescued from the power of darkness and have freedom in Christ! Thank you Lord! For the past five days I have been looking at what God’s word says about prayer. These studies have covered: seeking God’s approval/prayer; the proper attitude when praying; the power of prayer; praying for our country; and praying continually. But what about when I can’t even find the words to express my need? When the end was near, Christ he told his followers that he would not leave them alone. He would leave behind the Holy Spirit to comfort them. Here is another reference to the trinity; the Father, Son and the Holy Spirit who have existed since the beginning (Genesis 1:26) and will continue to exist to the end of time. Jesus was crucified, buried and rose on the third day (Sunday) just has he had said he would. He appeared later that same Sunday where the followers were gathered. Again Jesus did just as he said he would. I can rely on God’s word to be true. I am not alone. I have access to the Father through prayer through his Son Jesus Christ who died for my sins. I have the Bible which is the inspired word of God because the Holy Spirit spoke these words through the men who God choose to write them down. And the Holy Spirit will talk to God on my behalf when I can’t even form the words in prayer. I am not alone.